The St. Francis Foundation granted the Cairo Community Foundation $4,680 towards the purchase of a new Cairo Quick Response Truck. The Cairo Community Foundation and the Cairo Quick Response Team is grateful for this gift. The Cairo Quick Response Team responds to approximately fifty medical and firefighter team calls each year. The team responds to calls within 100 square miles of Cairo and supports other communities when the need arises. Over the years, 60 volunteers have stepped up to serve, on the team established in 1983. The Cairo Quick Response Team’s current vehicle is twenty years old. The truck transports only two crew members. The current truck is not designed to carry today’s modern medical equipment, like the Lucas Device. The truck creates a safety hazard for crew and patients because it lacks safety lights and reflective markings that meet today’s standards. 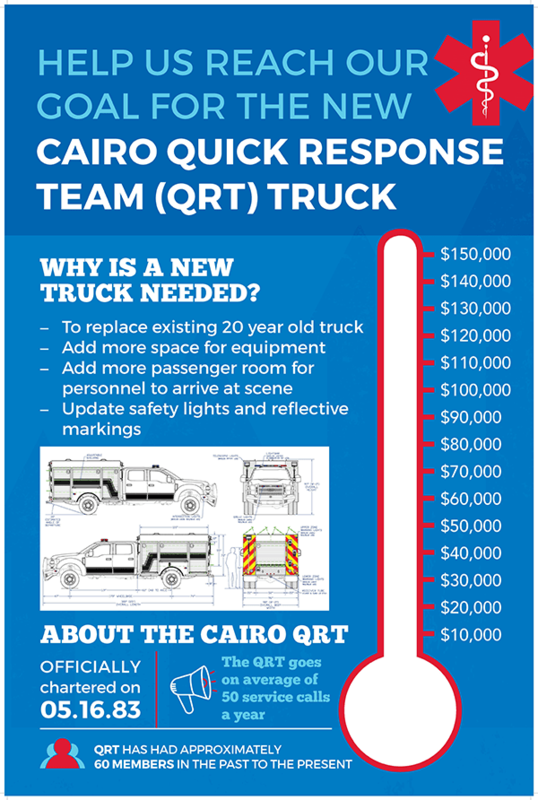 The Cairo QRT needs $150,000 to purchase a new truck. The new truck will transport more crew members to emergency locations. The new design will improve crew response times by making equipment more accessible. The truck will transport critical life-saving equipment. The Cairo QRT is hosting Dueling Pianos on February 2nd at the Cairo Community Center. Tickets for this fundraiser are sold online at Eventbrite. Tickets are available for purchase from Cairo QRT members and Pathway Bank. To contribute to the Cairo QRT Truck Fund contact Charity Adams with the Cairo Community Foundation. charity@cairocommunity.com or 308-379-9119.